Within the post, RinGs introduces its partnership with Women in Global Health (WGH), explaining what WGH is, what it does, and what it aims to achieve. RinGs is excited to announce its partnership with Women in Global Health (WGH). Like RinGs, WGH is dedicated to achieving gender equity within global health, particularly in the area of global health leadership. Through this strategic partnership we are able to strengthen our efforts to encourage and support the incorporation of gender into research, programs, and capacities at all levels. How have RinGs and WGH worked together? RinGs and WGH have co-authored a paper on the role of gender equity and women’s leadership in health system strengthening and resilience (forthcoming). 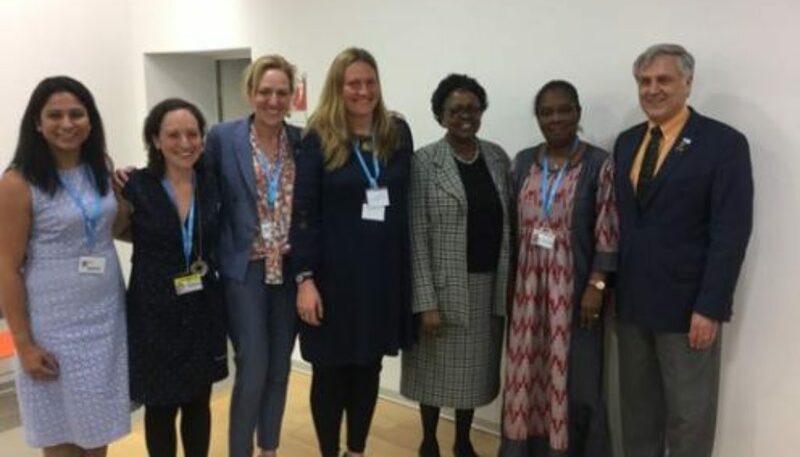 We have also worked together on a side event at the 69th World Health Assembly on women’s leadership, peace and security in health systems strengthening. Future events include co-hosting an event on gender responsive governance for women’s health and empowerment at the upcoming World Health Summit in Berlin, Germany, and working together on a panel on power and prejudice within global health institutions and processes at the Fourth Global Symposium on Health Systems Researchin Vancouver, Canada. See below for more information at Women and Global Health, including how to get involved! What is Women in Global Health? Women in Global Health (WGH) is an independent movement working with partners at all levels to achieve gender equity within global health leadership in order to achieve overall equity in global health. Our movement was conceived by a group of four women in Spring 2015, who each found their own unique pathway to global health but were asking the same question—What more can we do to elevate female leadership and bring it center stage? Women play a vital role in the advancement of global health, yet men still remain the majority holders of leadership positions. Leadership is key for improving performance, strengthening workforce capacity, enhancing connections with target populations, and accounting for specific considerations regarding their needs. Successful leadership contributes to the ability to adapt and respond effectively to change; equal leadership is key to that success and to achieving sustainable development goals’ (SDGs) targets. Together we call for all those working in global health to prioritise gender equality in global health leadership across all key stakeholders with a goal of 50-50 representation by 2030 in top global health leadership. We call on every global health leader to make a public commitment to achieving greater gender equality in global health. WGH works within these five areas individually and with other global health gender-focused organizations. We believe working with other partners and supporters to encourage stakeholders from governments, civil society, foundations, academia, professional associations, and the private sector to achieve gender equality in global health leadership. We coordinate with these groups to support and work on incorporation of gender equity in global health into their existing programs and capacities, while also fostering a culture of gender responsive leadership so they can be agents of change within their organization. Our activities range from co-authoring papers with Research in Gender and Ethics (RinGs) to co-hosting high-visibility events at the World Health Summit and World Health Assembly through our Women Leaders in Global Health Initiative, a joint initiative of Women in Global Health and the Global Health Council, which strives to address the individual, institutional and political challenges that impede women’s positioning as leaders in global health through strategic advocacy, networking, mentorship and capacity building. From advocating and stimulating public, global discussion among top global health and development leadership, to identifying, monitoring, investigating and researching the current data and trends on women leadership, gender analysis and women’s empowerment in the health sector, WGH seeks to create commitment from the health sector and broader development agenda to achieve social change. WGH is currently based virtually, with our founders residing in North America and Europe, and our team of advocates extends across and represents all regions of the world. Our cause resonates on a global scale and support for the movement is growing. We bring together students, early-mid career and senior professionals, and thought leaders from a wide-spectrum of sectors. By supporting and raising women’s professional attributes and organizational capabilities, we are one step closer toward closing the gender gap within global health leadership. Interested in finding out more about Women in Global Health and getting involved? Visit our website or join the movement today!